Waxaa halkaa khudbad aad iyo aad u cajiiba ka soo jeediyey xildhibaan, somalilandar ah oo ka tirsan magaaladda Västeråu taalla dalka Sweden, Xamse Xoor Xoor. Waa xildhibaan ka soo baxay xisbiga Center (C) ee dalka Sweden. Waxaanu helay tiradii ugu badnayd ee mushaarxiinta xisbigiisa Center ka. Leaders of the Somali government and Somaliland administration, currently in Djibouti, have agreed to continue their talks next month in Turkey, a source close to the talks said Sunday.The understanding came after Somali President Hassan Sheikh Mohamoud and Somaliland leader Amhed Silanyo held a meeting under the mediation of Djiboutian President Ismail Omar Guelleh. The meeting, held behind closed doors, touched on a wide range of issue, including peace and security of the region, how to tackle the threat of piracy and terrorism, aviation and air control, toxic waste dumping and illegal fishing, a Djiboutian official close to the meeting told The Anadolu Agency. The two sides agreed to continue their talks and sign an agreement on these issues when they meet in Ankara on January 15-16, the Djiboutian source told The Anadolu Agency. The dialogue between the two sides was “amicable,” the source said, adding the delegations of the two parties held four meetings on Saturday and Sunday. The source quoted Guelleh as saying after the talks that dialogue was the only means through which any misunderstanding between the two sides would be resolved. 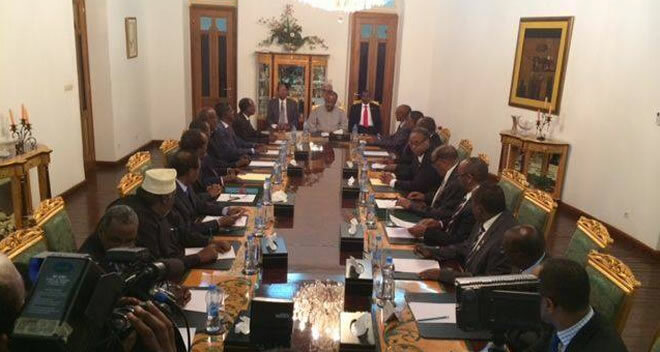 The delegation of Somaliland comprised 20 members while that of the Somali government included seven members, including the president and prime minister, the source said. Relations between the two soured when Somaliland, that enjoyed relative peace all through Somalia’s civil war period, declared independence through referendum, but the central government has never recognized the move. The talks are the second of such wide-ranging negotiations after the two leaders met last year in Ankara, where a dialogue process kicked off. Somaliland and Somalia emerged as one country in 1961 after achieving independence from Britain and Italy respectively. But Somaliland broke away from the rest of the country in 1991 following the ouster of President Siad Barre and the outbreak of civil war. Somalia, however, has consistently refused to recognize Somaliland’s independence. Until now, Somaliland has enjoyed relative peace – compared to Somalia, which has remained in the grip of violence since 1991. Safarkan uu madaxweynuhu ugu kicitimay dalka Jabuuti ayaa ku saabsan kulan ay labada madaxweyne ee Somaliland iyo Somalia ay ku kulmi doonaan. Labada hogaamiye ayaa la filayaa in ay ka wada hadlaan dardar gelinta wada-hadalada u dhexeeya Somaliland iyo Soomaaliya. wada hadalkan oo immika muddo sannad ku dhawaada hakad galay. Ka dib marki xagooda Soomaaliya, ka dhex dilaacay khliaaf siyaasadeed oo kalfiay in raysal wasaarayaal xukunka iskaga kala danbeeyey laga xajuubiyey rasysal wasaarinamadoodii. He is the man, Suldaan Abuubakar Cilmi Wabar (New Terrorist Leader in Awdal Region, Somaliland) that allows threatens country with violence and war. It was not long ago he was appointed chief of the so-called Suldan, July 2011, Borama, Awdal region. Somaliland. Today he is the greatest threats to Somaliland peace and stability. He has declared holy war against Somaliland. Has sworn to spill blood. He is very dangerous for peace in Somaliland and stability of Somaliland, neighboring countries (Ethiopia, Somalia and Djibouti) and the entire region. He has lived many years in Canada (North America), he and his family. He has added movies (video clip) on Youtube, where he expresses his threat to Somaliland. Government of Somaliland have sent security forces to where he is believed to be. and surrounded him, he and his terrorist group, he is now eastern Awdal region, with its terrorist group that threating the democratic elected government of Somaliland and its people with terrorist attacks. Somaliland’s defense minister, Ahmed Adami and a number of other ministers and the Somaliland Vice President Abdirahman Saylici is currently in Borama, Awdal region of Somaliland and try to get a picture of the situation and meet other suldans to see if there is a chance to convince him to lay down their arms and surrender to the government. Security forces await orders from Somaliland president, Siilaanyo is chief commander. The starting point is to kill him or capture him alive and bring him to justice. He Link with the dreaded terrorist group, Al Shabaab, which operates thier terrorist actions againts the neighboring country of Somaliland, Somalia. He financed by Al Shabab. Who have blood in their hands. They have killed thousands of people. Al Shabaab carried out the coordinated terrorist attacks in Somaliland, October 29, 2008, fatal in the capital of Hargeisa, Somaliland. In three different locations. It was suicide attack on the presidential palace and, UN.s office. and the Ethiopian Embasy in Hargeisa, more than 20 people died, including the President’s secretary. Rayaale president and his cabinet ministers survived the attack, they were in the presidential palace when Al-Shabaab carried out suicide attacks. about a hundred people were injured and some injured by suicide attack died of thier injuries later. Somaliland is part of the countries in the world to deal with the terrorists. Somaliland is working with other countries to exchange information, Somaliland intelligence cooperates with other intelligence services in the world against terrorism. If you do not handle Suldaan Abuubakar Cilmi Wabar (New Terrorist Leader in Awdal Region, Somaliland) there is a risk that he recruits and inspire other young people and other blood-hungry terrorists to come to Somaliland, to destabilize the country.